What's more important in today's computer applications courses? Building important competencies and skills? Or teaching students to use a specific application? "Business & colleges recognize that specific software will be dead by the time kids get to them. Can't prep them for 5-8 years from now! #busedu"
I had the opportunity to talk about teaching trends for competencies and skills in Google Applications and Microsoft Office with our product development manager, Ken Richard. How is AES responding to the increased popularity of Google Applications in computer applications courses? Sarah: Hi, I'm Sarah from AES and I'm here with Ken Richard who is our product development manager. Sarah: Hi. We are going to talk today about Microsoft Office and Google Applications. This came up because we have teachers asking us about this. I was really surprised last year when a teacher said, "We don't have Microsoft Office anymore. We have to use Google." I've seen that, too. My kids are in elementary and middle school and that's all they use. I want to know how AES is responding to that need that seems to be out there. Ken: Sure. As you know, we have curriculum for Microsoft Office. We decided to come out with curriculum for Google Applications. It seems like a lot of schools are moving to Google Applications, because I think it's a lot easier for the schools to manage through updates, versions of operating systems, or taking care of anything on the desktops. Ken: They just sort of have to turn it on and it's free for schools and it runs in the cloud. It's really easy for teachers and students. 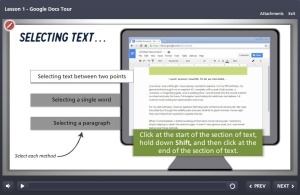 It's also easy for teachers to share documents with students and students to hand documents in to teachers. It's a great tool for schools. What we're going to do is we're going to come out with a set of fundamental modules. Ken: We're not going to go real deep at first. We kind of just want to cover the basics. The students learn how to use word processing, spreadsheets, power point, and we'll also have an overview, too. Ken: Down the road if the units are popular and teachers like them, we'll probably come out with more content. Ken: Just because the outcome is first. Sarah: Wonderful, that sounds great. Tell me a little bit about projects, because I've heard that going around here. Tell me about how projects come into this new Google Applications stuff that we're doing. Ken: Sure. We have a number of projects for getting started with Microsoft Office. What we've done is we've moved the same projects over to Google Applications. These are projects that we know students and teachers are happy with and get through. We tried to make them engaging and fun for the students. We try and keep them a little light-hearted. For example, with Excel, first project is a pancake recipe. The students have to go through and use formulas and functions to modify the pancake recipe from 1 person to 3 people to a larger group. Ken: We try to do everything as hands on project so the students actually get practice using the applications and they can build their skills and competencies. We also try to work in vocabulary at the same time, because students need to know a little bit about what they're doing, why they're doing it, what it's called so that they can communicate with others when it comes times. If someone asks them to create a spreadsheet with formula, they need to know what that means. How are Google Applications projects graded? Sarah: Right, great, okay. On the teacher side of that then, how do these projects that the students are producing, how do they get graded? Ken: Sure. There are some packages out there that automatically grade student work for Microsoft Office applications and there could be for Google, I'm not sure. The problem with those is in order for them to work, the projects have to be very rote. The students are told, "Take this line. Make it bold. Underline this word." It's not very interesting or exciting to the students. We try to build more creativity into the projects and students can sort of make it their own. We let them make choices as they're going through, what font they want to use, what colors they want to use to kind of making it a little bit more fun for the student, engaging and kind of let them explore a little bit in the applications. Ken: Because the projects are a little more free form, they can't be automatically graded. Ken: Students can hand the assignments into the teachers through Google or whatever mechanism the school has. Sarah: Okay, great. Also on the teacher side, besides what the students are doing online and doing in Google Applications, what kind of resources are out there for teachers to help support them through these activities and projects? Ken: Sure. The first thing we have is a course guide. The course guide sort of gives an overview of the entire arena for Google Applications. The course guide gives you a list of the modules, tells you about how long each module is going to take, and sort of gives some general teaching tips across all the applications. When it goes into each application, we're going to have a set of lesson plans for the teacher, which are already pre-created. They can either use them as is or they can copy and paste and modify them. Ken: We're going to have a power point, which the teachers can use to introduce the material before the stunts actually get started. We have quizzes and tests that the students can take online. They're automatically graded and we provide answer sheets to the teacher. I guess that's it. Sarah: Okay, good. This is just sort of an over-arching question. With your experience in the curriculum side of things, is there a strong feeling of Microsoft versus Google out there? Ken: It's interesting because I think things are really changing quickly. In the past, if you look back 5 or 10 years, Microsoft was everywhere and everybody had to learn Microsoft. I think some of those barriers are breaking down now. Google is definitely much more important than it used to be. Chrome books are very popular in schools, so that's something you might want to think about. I think the most important things for students to learn is the concepts. We have to learn about what a spreadsheet is, how to interact with a spreadsheet, and the specific tool may not matter so much because if these kids are in 7th, 8th, 9th grade technology is probably going to change again before they graduate and enter the workforce. Ken: The most important thing is that they learn kind of the core competencies and the core skills, they learn how to learn a new product, and my personal recommendation would be to have students learn both. If they learn Excel and they learn Google Sheets, they can kind of compare and contrast the differences and they'll understand, they'll get a deeper understanding of both applications if they learn them each separately. iPads, ChromeBooks, and Google Apps, oh my! Sarah: Great. I think that's a great idea, great theory to cover both. They're well prepared, very good. My last question just has to do with maybe more just a technicality kind of issue. The rise of iPads and Chromebooks and what not, how does that affect the Microsoft and Google applications issue? Ken: Sure. Google Applications can work on the iPad, but we're not going to be recommending that for a curriculum. I think if students are doing projects, especially word processing, spreadsheets, creating presentations, they're going to be much better off with a desktop or a laptop or a Chromebook because it has the keyboard and track pad or mouse. I think that will just give them a lot better control of the applications. We're not going to, we're not planning on testing the Google Applications on the iPad. We want to make sure it works on Chromebooks, laptops, desktops. Sarah: Okay, very good. Well that's all that I had. I really appreciate you taking time to explain the importance of competencies and skills to me. I hope you all enjoy it and if you have any questions, just give us a call. Thanks. 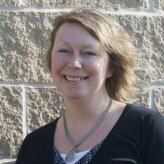 Sarah has been with AES since 1998, first serving as a curriculum developer, and now as a customer support analyst and content creator. She is committed to helping instructors gain experience and confidence using our solutions and to providing excellent customer care.